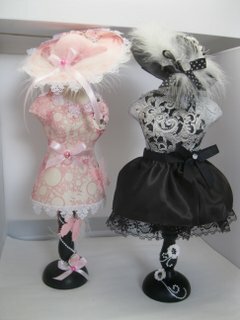 These beautiful miniature Dress Form Hats are the finishing touch to the mannequins that you have been creating. They are very easy to make and a good opportunity for you to use up some left over materials that you may have in your "Stash"
Before you start you will need to buy a Polystyrene ball and you will need to choose the size so that it fits the dress form that you have chosen. You will also need to decide what colour you wish your hat to be. 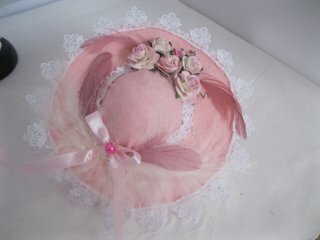 Raid your "Stash" for any pretty lace of ribbons that you have and consider adding in feathers and flowers too. 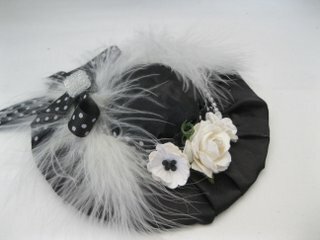 You can make these as pretty as you wish and they are the finishing touch to all the dress forms that I have made. In the video for the Dress Forms I showed you how to get a beautiful pattern on your mannequin using your favorite stamp. This tutorial will show you how to make the hat to add to the top and in the next one I will show you how to complete the look by making your Dress Form a lovely skirt to go with it. They really are not hard to create but can make all the difference if you are going to give these as a gift to the ladies that you know. My daughters and Grand-daughters all want one so guess what I will be doing over the next few weeks. The Dress Forms that I have used are all from IndigoBlu and they come complete with the stand. I have added in the hat peg with Shaker Pegs simply pushed into the top. This is such a pretty project to do and I am sure that you will not be disappointed with the end result.